by Jeffrey Ian Ross. Bristol: The Policy Press, 2012. 209pp. Hardcover $89.95. ISBN: 9781847426802. Paperback $39.95. ISBN: 9781847426796. Jeffrey Ian Ross is a Professor in the School of Criminal Justice and a Research Fellow of the Center for International and Comparative Law at the University of Baltimore. Much of his work has been dedicated to developing our understanding of the concept of “political crime,” which generally encompasses both crimes committed against the state and crimes perpetrated by the state. This is vitally important research and the topics considered in his book, An Introduction to Political Crime, are among the most pressing issues in this day and age. He is to be applauded for his effort to bring together disparate lines of research under the rubric of political crime and readers will learn much from this book. It is important to note, however, the present text is actually an updated version of Ross’s previous textbook along the same lines from a decade ago, The Dynamics of Political Crime (p.xiii). And so, readers should bear in mind that, while the text is indeed “more current” (p.xiii), including examples and cases studies in the wake of 9/11, for example, much of the book is still rooted in controversies and catastrophes of the four decades preceding the publication of the first edition. 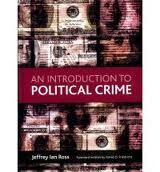 Following a Preface that advances distinctions between the two editions, Chapter One seeks to provide a working definition of “political crime” for readers who may be unfamiliar with the concept, which certainly seems appropriate since the book is after all meant to offer an “introduction” to political crime. That said, while this chapter provides several interesting issues to consider, it seems that the writing could have been a bit more direct and to the point. Even after reading the chapter multiple times, I still never quite located the point at which Ross offers his own definition of political crime. In the “Summary” of the chapter he writes that “The previous discussion introduced a definition of political crime and its various types” (p.13), but it still did not quite come across clearly enough by my reading. He is successful as he “strives to explain the nature and dynamics of political crime” (p.12) in the United States, Canada, and the United Kingdom, which he does by reviewing the motives, membership, victims, effects, targets, and perpetrators of political crime, but still an explicit definition would have been helpful – particularly in a book meant to provide the stated “introduction.” To be fair, it does seem an implicit point that the concept evades easy definition, but when addressing what appears to be a remarkably nebulous notion – and when reviewing the definitions of other scholars along the way – it would have improved the text if we could see a more clearly [*583] articulated definition of his own. In some ways, this example is symptomatic of other problems with the book. While alluding to debates within the literature urging greater conceptual clarity, Ross still seems intent on fitting – and I would say forcing – widely divergent varieties of individual, group and state activity into the text’s various typologies. To this point, as he observes, “[a]lmost every conceivable political crime is covered” (p.13), which is good in the sense that it makes for comprehensive coverage, but which is ultimately problematic because it undermines the larger project by giving the textbook an “everything but the kitchen sink”-sort of feel. In other words, it provides a laundry list of elements that might make for “political crime” (leaving me to wonder what would not be a political crime) and is then compelled to cover all the imaginable offenses that could be deserving of the designation. One example of this phenomenon appears in the section where Ross is examining the ten varieties of “state violence” that are most often discussed in the scholarly literature. Here, he includes what is almost certainly the most horrendous thing a government could do (genocide) but also gives attention within the same discussion to instances where suspects have been bitten by dogs used in K-9 units (pp.140-41). Certainly being bitten is a serious and unfortunate event, but does it belong in the same discussion as “the systematic killing of an ethnic, racial, religious, or cultural group” (p.139)? Ross is attempting to provide a complete survey of the field here; and so apparently “dog bites” are seen by some scholars as instances of “state violence.” At the same time, it feels awkward and, to me at least, undercuts the very serious and important observations he makes about other more conventional instances of state violence. These sorts of questions are particularly appropriate to consider given Ross’s vision of this text as “appropriate for classroom adoption” (p. xiii). It may seem counterintuitive for a textbook meant to be an “introduction,” but in this instance my pedagogical instincts tell me that less might actually be more. In Chapter Two, Ross begins by noting that “[f]ew scholars have developed a theory of political crime” (p.18) and then provides a succinct overview of “psychological” and “structural” theories before ultimately introducing his own contribution: the ISOR explanation. This notion posits that political crime “is the result of a complex interplay among individuals (I), situations/ opportunities (S), organizations (O), and resource adequacy (R)” (p.24). Ross believes this theory “has the advantage of breaking up behavior into an easily understandable process,” although he concedes that “not all outcomes can be explained” (p.27). The theory may or may not be compelling to readers, but the larger issue here is that the ISOR theory really does not receive any attention throughout the rest of the book. The contemplation may be implicit in places, but since it was introduced early on in the text, it seems it should have played a more prominent and explicit role in shaping Ross’s discussion of the myriad examples and “cases” that constitute the remainder of the text. Chapters Three, Four, and Five deal with “oppositional” political crimes, i.e. [*584] essentially anti-systemic crimes or crimes against the administration of government. In Chapter Three we learn that the “broader rubric” of oppositional political crime “includes treason, misprision of treason, rebellion, espionage, sedition, suborning of perjury, false swearing, bribery, contempt, obstruction of justice, resisting arrest, escape, and misconduct in office,” although he also concedes that only “[s]ome, but not all, of these crimes have a political motivation” (p.29). This paves the way for Chapters Four and Five where the book really begins to develop some traction. In the Fourth chapter Ross addresses topics such as dissent, sedition, espionage and so on and manages to offer an adequate survey of various specifically “nonviolent” forms of oppositional political crimes, before transitioning into a discussion of their “violent” counterparts (e.g. assassination, terrorism) in the following chapter. These chapters provide numerous effective examples to consider; but they could have been even more compelling and readable if there slightly less compartmentalized. Chapter Five, for example, spans sixteen pages of text, but includes seven headings and fourteen sub-headings, all of which compound the impression expressed above that there is so much crammed, and thus cramped, within this textbook that it adversely affects the product. The remaining chapters in the book follow this same formula, with Chapter Six dedicated to an overview of “state” political crimes, or those which are perpetrated by the government, and with Chapter Seven focusing on political corruption, Chapter Eight addressing illegal domestic surveillance, Chapter Nine attending to human rights violations, Chapter Ten looking at “state violence” (perpetrated by police, national security, and the military), and Chapter Eleven examining myriad financial crimes under the rubric of “state corporate crime.” Finally, the Conclusion’s subtitle hints at its ultimate purpose: “controlling oppositional and state crime” (p.159). Like Chapters Four and Five, Chapters Seven through Eleven include a host of examples to give contour and texture to the concept of “state” crime, but also like the preceding chapters those in the latter half of the book contain some curious and seemingly overbroad claims. Equally problematic are assertions such as: “the protection of human rights at home and abroad is seen as a cornerstone of left-wing ideology” (pp.115-116). This is both overstated and under-inclusive in its failure to appreciate the nuances of American political thought. In the United States, for example, “right-wing ideology,” particularly that of a libertarian and oftentimes even evangelical Christian variety, at least purports to be averse to certain sorts of human rights violations around the world. And then there is the odd example where Ross points to the War of 1812 as an alleged “human rights violation in the United States,” because British citizens were deported or voluntarily relocated during the war. The problem – again – is not that this is wrong (although it seems like a stretch to me), but does it really warrant attention – even the two sentences it was allocated – under a sub-heading that also attends to the controversy over detainees at Guantanamo Bay (which gets six pages)? But a final set of examples will illustrate just how much this text could have benefitted from much more vigorous and attentive editing. Throughout the book, there are significant typographical errors. Some are spelling mistakes (e.g. “statues” instead of “statutes” on p.50;, referring to the former Attorney General as “Alberto R. Gonzalez” instead of “Alberto R. Gonzales” on p.121; and referring to “Phnom Penh” as both “Phnom Penn” and “Phnom Phen” on p.140). And some probably crept in during the editing process (e.g. “He is in enamored” instead of “He is enamored” on p.104, and “incidents of death sin custody” instead of “deaths in custody” on p.143). In total, I noted over a dozen different typos – but I also stopped counting after that point. Hopefully if the book makes it to a third edition Ross and his publisher will take the time necessary to better proofread the final copy and tighten up – while also flushing out – the narrative so that it truly can serve as an effective “introduction” to what is without question a serious and compelling matter of public concern.